There is a lot of news to report, but this is the only piece with a picture, so....this is what I'm blogging about this evening...I had put my cake decorating bags and dyes away for awhile and pulled it back out this evening to make a cake for my friend's son who is turning five tomorrow. 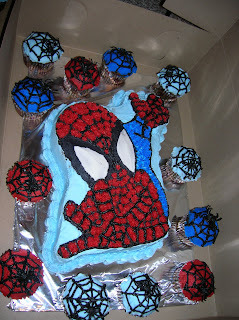 He is in love with super heros, and more specifically Batman, unfortunately there are not any Batman cake pans at the moment on the market, so we negotiated on Spiderman. We planned out the cake....and then about ten additional people rsvp'd, so we add some cupcakes to the mix (complete with a little web and plastic spider...which was a bit of an overkill). For ALL of you who are planning on taking up cake decorate ;o): the most difficult thing about coloringicings are black and red colors, so a lot of my efforts were concentrated there (but I finally got it where I wanted it). I also made the error of putting shiney side up on the foil, or else you would be able to see the additional 'Spiderman cupcake holder detail.' I remembered why I don't do this often-it takes WAY too long and makes a HUGE mess. Regardless of that detail, I'm glad I put some of the supplies to use....another cake down. 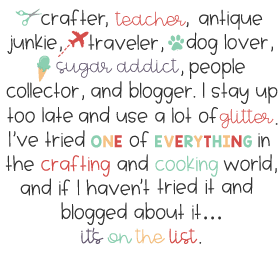 I hope it will be awhile before I do another, but I enjoyed it while it lasted and know I will want to do another one, it's always fun to make cakes for my friend's kiddos. 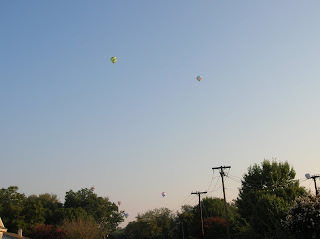 As I was driving to see my Mom on Saturday morning the balloons were just launching up over my neighborhood from the balloon festival (about a mile from my house) that took place this weekend. Once they are all up there are anywhere from 20-30 you can see around the neighborhood. We were also able to enjoy the launches 2 times a day from my Mom's hospital room 20 minutes away in central Plano. All went well this weekend considering the nature of the situation and they have sent my Mom home this evening less than 48 hours from when she got out of a five hour surgery and 2 hour recovery process (insurance is interesting). I think she was ready to get home regardless. There is a lot of healing, test, and surgery left to do, but the 'big surgery' is now over with and she can concentrate on mending until the next step. My aunt and I pretty much camped out at the hospital, and we also had a lot of support through calls and visits over the weekend. My Mom's bi-lateral surgery is scheduled for 12:30 on Friday, please pray for her before/during and after the surgery as she anticipates the surgery, her doctor's do their best work (5 hours of surgery), and she wakes up in a recovery to new experiences. My biggest prayer is that God's plan, and work can be seen clearly through these experiences and peace is brought with that wisdom. Happy 23th 29th +1 Day Birthday to Mom! Mom's birthday was yesterday. Barbies+Pink+Lots of Dr Pepper=A Good Time. Some of us (us being-my Mom) have bitter memories regarding their mother's decision about a Barbie vs. a Tammy doll (apparently Tammy was less 'developed' and controversial at the time). The theme this year was 'Barbie' thanks to my Aunt Lois, who even got my Mom her first Barbie doll (among other things)....and Ken-I always wanted enough Ken's for all my Barbies to have a boyfriend (I had to borrow my brother's GI-Joes-which were much shorter)....but I guess I was preparing for real life. There aren't enough Ken's for us Barbies-all we have left are the short, green men. Yesterday my Mom, aunt, cousin and I went up to Prestonwood Baptist church for a conference called Transformed. 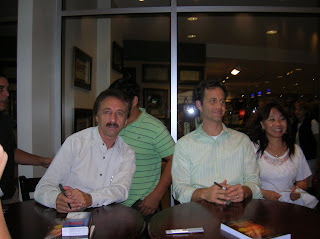 It's a traveling group of speakers, which includes Kirk Cameron, Ray Comfort (both featured) and 'two other guys' who were very funny. It lasted four hours, and was full of laughs...and great information. Afterwards, my friend Alicesun and I were hanging out at the cafeteria waiting to head to a dinner party and when we were walking out there was a long line of people waiting for the men to sign their books. Alicesun was a trooper and took the camera I had in my purse (no, I did not bring for that reason) and got a picture for me (or maybe it was for her ?). I was really impressed by the Christian example Kirk Cameron is setting in Hollywood, and I can't wait to tune into The Way of the Master which is on national radio, and there is also a TV series which has won a lot of awards by the same name. Here is my learning for the weekend: I decided it was time to get rid of the king size mattress in my guest room that someone kindly gave to me because another kind person (Kelly) gave me a full size mattress that would take up less room. The king is very nice, pillowtop has a frame etc. I advertised it on a local sales site for FREE. 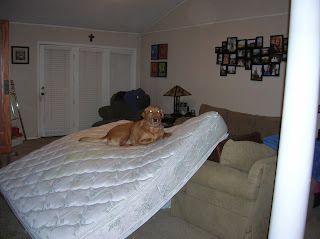 At this point, the mattress is still in the room waiting for a new home. There has to be 50 emails, but finding a taker is almost impossible. I began by simply moving up the list of request and deleting all of these "...are there box springs too?" "...is it firm or soft?" "...what kind of condition is it in?" "....do you think you could deliver it to my house, all I have a is a car?" and those are just the ones I knocked off in the last few minutes. IT'S FREE...I think a simple "I'll come pick it up, give me a time." will do. I went with those simple emails first, so far two people never responded when I emailed back and said I still had it and they said they could come get it asap....so I wait for a response....and then finally move to the next person, one lady who responded to the ad 'free king size mattress and frame' then decided her friends who 'desperately' needed a mattress because they had been sleeping on air mattresses for the last month and could barely even get off the floor in the morning would rather have a queen, now I'm waiting on customer number 6 to see if they return my email and say they can take it. I think if I had said it was $20 bucks it would have been out of here so much faster. What should the moral of this story be I wonder? Last year my Mom and I began what we knew would become a tradition. As of September 1, 2006-it had been a year since my Mom had surgery to remove her breast cancer. 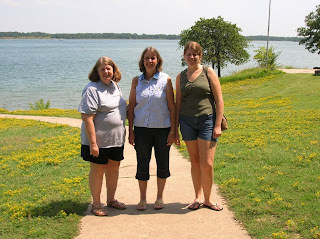 This year in celebration we planned to again celebrate the day, and have some girl time with Lois and Holly while visiting Lake Murray (for the day) one last time before they began the remodeling process at the resort. The yellow flowers were in full bloom, the lake was full of boaters, and the pool felt great. It was nice to get away because this past Thursday my Mom found out that her cancer has returned. 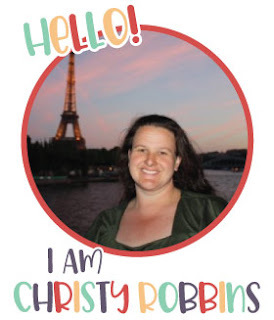 She has an MRI and a meeting with her surgeon schedule for this week to learn what about the next steps she will need to take. We will continue to celebrate on September 1st, and next year we will have even more to celebrate. Please keep her in your prayers in the next few weeks especially as she prepares for surgery and all that follows.